AT THE TURN of the 20th century, infertility became an obsession for the eugenics movement. The growing scientific field of genetics led some political leaders to embrace the notion of controlled breeding to favor "advanced" races. White Americans feared an "infertility crisis" in their neighborhoods. 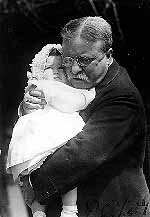 President Theodore Roosevelt warned in 1903 that immigrants and minorities were too fertile, and that Anglo-Saxons risked committing "race suicide" by using birth control and failing to keep up baby-for-baby. The notion of breeding as an act of national service would reappear during World War II.